As part of our strong commitment to education and scientific dissemination, we have designed a physical simulator and demonstrator of the legendary Ariane 5 rocket. The model is interactive and shows the different stages of the rocket, it’s perfect to be used in museums, schools or other centres. 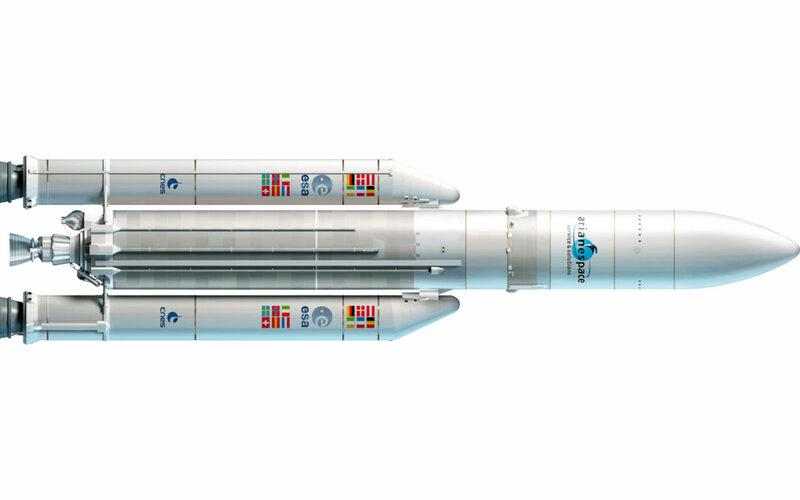 Arianespace’s Ariane 5 is the world reference for heavy-lift launch vehicles. It is able to carry payloads over 10 tons to Geostationary Transfer Orbit (GTO) and over 20 tons into Low-Earth Orbit (LEO). Ariane 5 rockets have accumulated 94 launches since 1996, 90 of which were successful, yielding a 96% success rate. Since April 2003 Ariane 5 has flown 80 consecutive missions without failure. Ariane 5 rockets were used in iconic missions such as Rosetta, XMM-Newton, Galileo, Herschel and Plank, making it one of the most famous launch vehicles ever. Cryogenic Main Core Stage (EPC): The EPC is the biggest stage of Ariane 5. It has two main components: A huge 24 metres high tank with two fuel compartments, one for liquid oxygen (LOX) and one for liquid hydrogen (LH2); and a Vulcan II engine at the base that burns the 170 tons of fuel in no more than 9 minutes, providing a thrust of 1,390 kilonewtons (in vacuum). Once the boosters separate (about two minutes after lift-off) the EPC is the only thrust source. After the main cryogenic stage runs out of fuel, it can re-enter the atmosphere too, for an ocean splashdown. Second stage: The second stage is on top of the main stage and below the payload. It provides a final thrust once both the EAP and EPC run out of fuel. Depending on the Ariane 5 version, it may be a Storable Propellant Stage (EPS) fueled by monomethylhydrazine (MMH) and nitrogen tetroxide (N2O4) and capable of multiple ignitions, or a Cryogenic Upper Stage (ESC) which is fueled by liquid oxygen (LOX) and liquid hydrogen (LH2). Fairing: On top of everything, after the four engines and tons of fuel, is the fairing. The fairing is used for aerodynamic stability and protection from heating, it covers the top of the second stage and the payload. Once sufficient altitude has been reached (typically above 100 km) the fairing as no more use and is jettisoned. Our model, is a physical simulator and demonstrator that shows this four main structures and how they work. It’s not like you can put it into orbit, but it’s helpful to understand how this is done with real launch vehicles. You can interact with the different stages and check how they are assembled together or how they are ejected when they are no longer needed.